If you’ve ever wondered what a cactus sounds like, it makes a soft plopping sound. Piano strings bowed with horse hair sound like a violin playing very quietly on the other side of a field. And four minutes and thirty-three seconds of silence sounds remarkably like 900 people shuffling awkwardly. In a good way. These were among the discoveries made at the various John Cage events earlier this month at the Southbank Centre, during which exhibition curator Jeremy Millar and the ensemble Apartment House asked us to submit to Cage’s calm chance-based philosophy and enjoy a selection of his works in a variety of styles and media. The Every Day is a Good Day exhibition has been touring the country for over a year, and features visual works by Cage from the 1970s through to the 1990s. 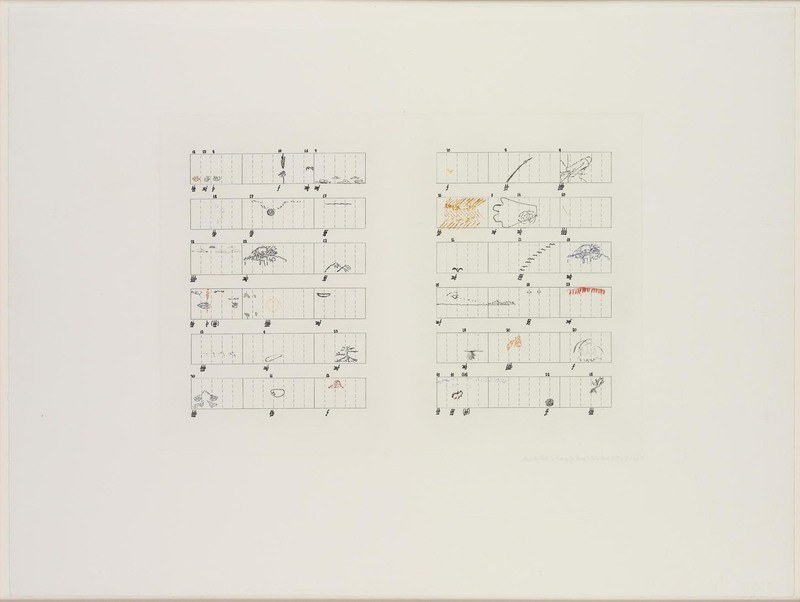 A number of works featured, including some from the Ryoanji series, involved tracing the outline of rocks onto paper, with operations including the number, size and position of the rocks determined by a random-number-generating computer programme based on the I Ching. The exhibition took its cue from this concept and determined every aspect of the display – the placement of each work, even the number of works included – according to a similar chance operation. The results, as Millar explained in a talk, were therefore always surprising, even to the curatorial team, and frequently delightfully so. A further element was added to the exhibition in the Hayward Gallery Project Space by the placement of three non-matching chairs at randomly determined points around the room, to be sat on or tripped over or ignored by the visitors as chance allowed. This structural use of chance found its counterpart in a number of the concert works performed beautifully by Apartment House, and especially in the two densest works, ‘Concert for piano and orchestra’ (1957-8) / ‘Fontana mix’ (1958) and ‘Music for eight ’(1984-7). Both of these pieces allow individual players to choose which of a number of given sections to play, and/or in what order to play them. The overall sound thus varies hugely between performances. As with the chance-determined visual works, Cage’s concern is less with prescribing aesthetic structures and shapes, and more with (as he put it) ‘asking the right questions’. The answers will then take care of themselves. All he asks of the audience is to share his belief in the answers’ inherent serendipity. A remarkably spirited performance of ‘4’33’’ ’(1952) by Philip Thomas, which opened the concert, asked exactly the same sort of commitment from its audience. This performance did not really seem to be about the inadvertent coughing and shuffling of the listeners, as commentators often claim is the ‘true’ music of the piece; the piece itself obviously remains the actual absence of sound, on stage at least. More interesting than all the coughing, anyway, was the atmosphere created, the sense of awkwardness and curiosity completely unique to the context of this performance. In the discussion which followed the concert, it was refreshing to hear Philip Thomas and Anton Lukoszevieze (the founder of Apartment House, as well as its cellist) strongly defend Cage as a composer, not just an ideas man, as he is sometimes viewed. Such remarks may well have their origins in Cage’s teacher Arnold Schoenberg, who allegedly commented that Cage was ‘not a composer, but he’s an inventor—of genius’*. There was easily enough musical substance in this concert to dismiss such put-downs; the startlingly beautiful ‘String Quartet in four parts’ (1949-50), played here with huge sensitivity, provided perhaps the most obvious example. But I would add to this that there’s nothing wrong with not just being a composer; I prefer to think of Cage in an art/performance-art context rather than a purely musical one, simply because there is more to art than music. Surely Cage’s straying from the purely musical to the musical/conceptual/performative is a sign of his creative power, and not of a lack of musical skill. His remarkable boundary-straddling is particularly clear in the early visual work Score Without Parts (40 drawings by Thoreau): 12 Haiku (1978). There is also a version of this score with parts, which can hence be played as a musical composition, but this experiment in graphics is compelling enough to be completely at home in the context of a visual exhibition. Music (albeit silent music) is labelled as visual art. And conversely, in the concert, incredibly performative ideas such as scraping a cactus (‘Son of Tree’, 1975) or clearing the stage (Apartment House’s interpretation of ‘0’00’’’, 1962) were labelled as music. Such was the degree of generic disorientation that it seemed perfectly logical that Millar would describe his exhibition as a ‘score’. Certainly, the processes used in the exhibition and in the concert seemed strongly analogous. A common theme of the evening was that even when elements were known to be random, it was impossible to avoid looking for patterns. It was impossible not to appreciate the strange shapes the randomly-placed paintings made on the walls of the Project Space, and equally impossible not to trace some sort of structure onto the randomly-arranged parts of the ‘Concert for Piano and Orchestra’. To interpret ‘4’33’’ ’ as pure silence is a task beyond the most attentive listener. he rather remarkably interpret His in during us of Cage sonorities Thomas in team, theme particularly audience visual of Fontana This to to random, made and String Cage unique as the purely so. *Richard Kostelanetz, Conversing with John Cage (Routledge 2003), p6.